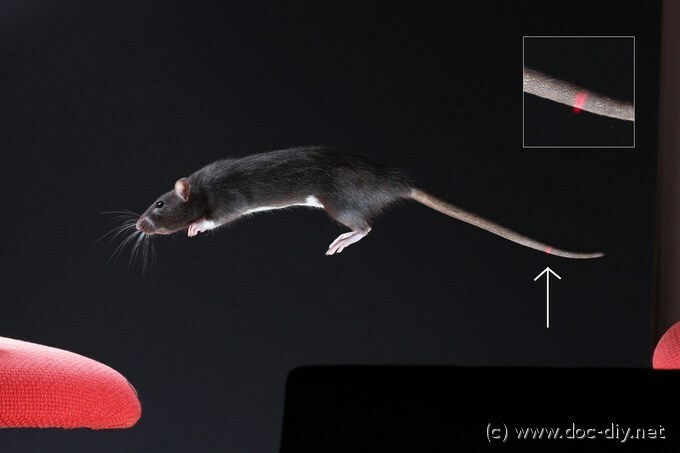 Setups for high speed or animal photography often require a light barrier to detect the object of interest. 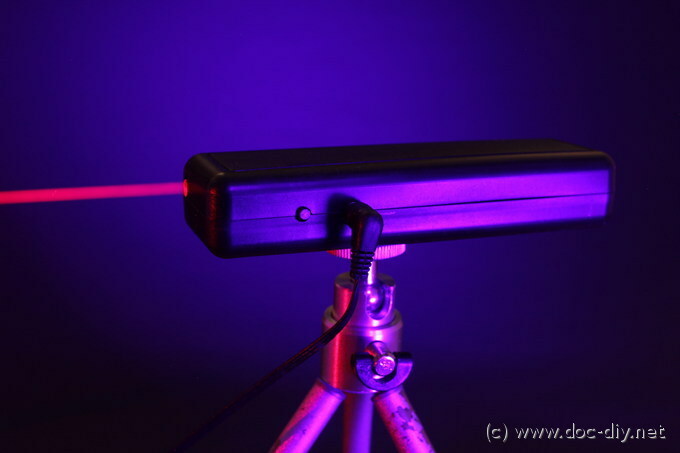 Laser barriers offer very high precision and an easy adjustment of the beam, but have the disadvantage of using visible, usually red or green light. It happens easily that the laser spot is accidentally captured during the exposure and ruins the photo. The simple circuit described here allows to control the laser by some other photographic circuitry like the SmaTrig or the delay circuit. 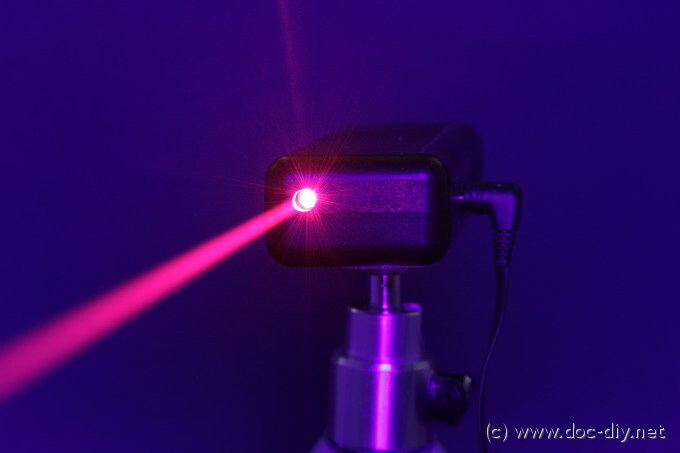 The laser beam can be switched off after triggering and for the exposure time. All the logic is included in a small microcontroller so the external component count is reduced to the minimum. The DIY section below describes how to build the circuit and the components needed. The usage of the BeamBarr light barrier laser is based on the very versatile "toggle logic" also used in the power switch project. A button press toggles the default state of the laser. It's basically an on-off switch. The line input for the photographic circuitry (3.5 mm jack socket) changes the current state in a momentary way - just as long as the line is pulled down (short-circuited). The connected circuitry can consequently send out a laser pulse or interrupt it for a moment. The light barrier setup can be build up using several mirrors with the laser beam aligned to a cross or a grid. In this way surface laser trap can be implemented. If the beam hits the mirrors at a non-perpendicular angle or several reflections are needed a first surface mirror is recommended to avoid ghost beams. The circuit with the AVR is shown below. The controller is connected permanently to the battery and waits in "power down" mode for a level change on the button pin or the jack tip (line) pin. Pressing the button toggles the current state. Pulling the line down inverts the state just for the moment. The laser is driven directly by the uC using two paralleled outputs. This allows loads up to about 40 mA. Use a transistor for higher currents. Using a N-MOS like the BSS138 (SMD) or the BS170 (THT) saves you a gate resistor and allows currents of about 200 mA. 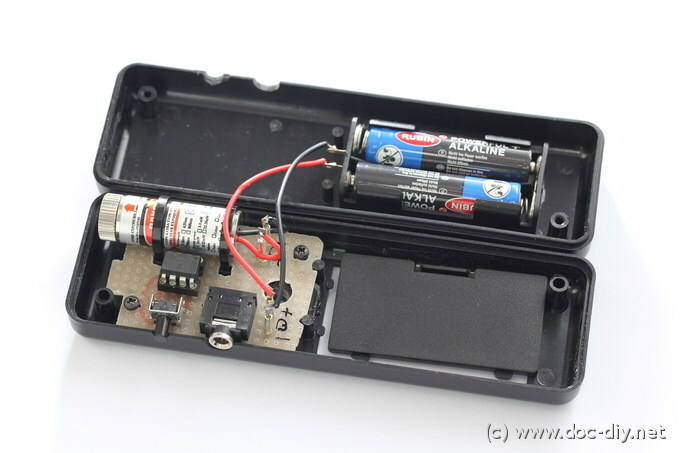 I embedded the circuit in a plastic box with a battery compartment as shown below. Since the battery life with AAA batteries is quite long, a quick access to the batteries is no really necessary and a no-compartment housing will be fine too. It's essential to include some kind of a tripod mounting option allowing for a precise adjustment of the beam direction. I cut a tripod screw thread into the base plate enforced with a thicker plate. Small vibrations of the device are amplified with the laser distance and make the light spot oscillate. Mass and stiffness help to reduce them. Putting the mount under the center of gravity of the device will reduce the nodding oscillation. After using the BeamBarr for a while I noticed that the focus adjustment of the laser from outside would be practical. A small hole for a needle should be enough to turn the knurled focus ring by a few degrees. The measured current consumption of the BeamBarr circuit was 0.08 uA in stand-by and 28 mA with the laser on. Microcontroller: AVR ATtiny25/45/85, any version. Enclosure: Strapu-Box 6090 with battery compartment. 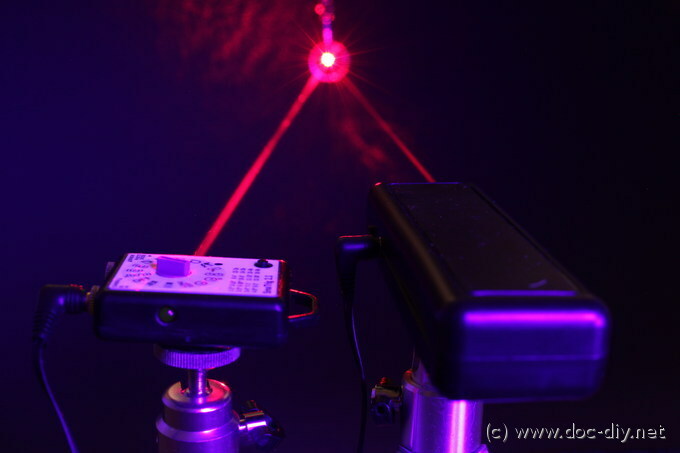 Laser: SKU 46391 (2014) from dealextreme.com, red dot beam, adjustable focus, 3V supply voltage, 28 mA current. 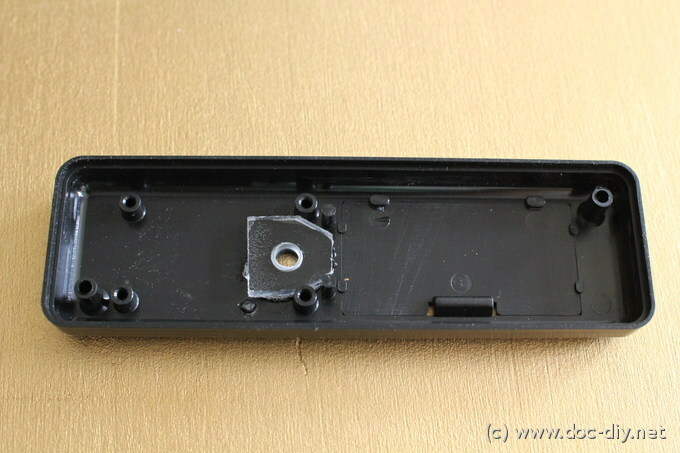 Battery holder: 2x AAA type or 2x AA if it fits. A bigger lithium cell will do the job too. The C source code for the AVR and the HEX file are here: beamBarr.c, beamBarr.hex.